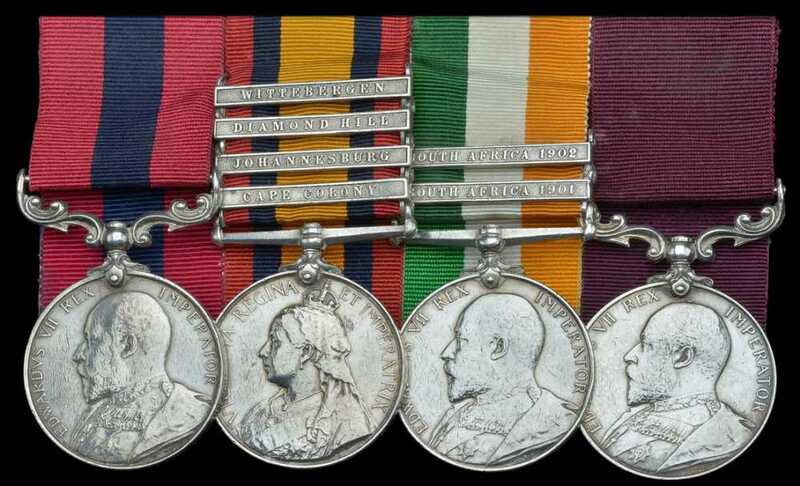 There were no less that 7 Boer War DCM in the February DNW auction. 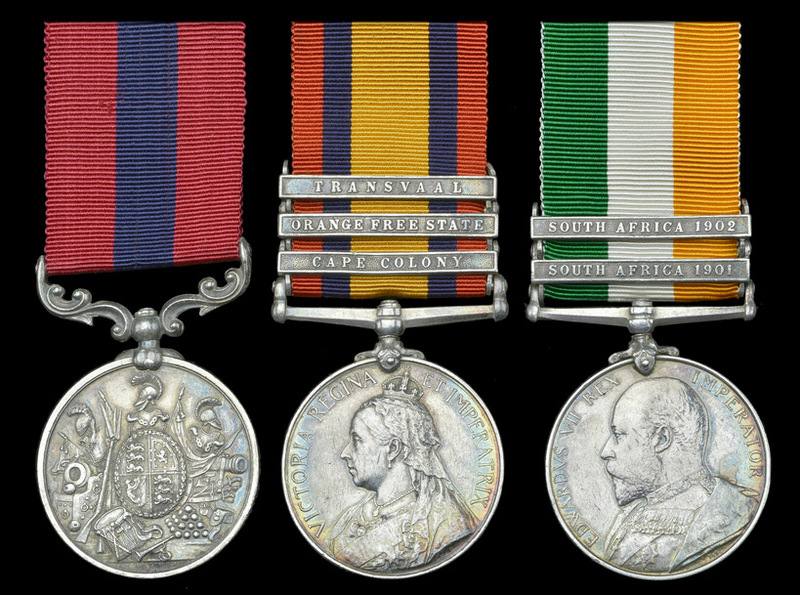 A Boer War DCM pair awarded to Company Serjeant-Major F. E. Greene, Royal Garrison Artillery DCM VR (49007 Serjt., R.G.A. ); QSA (4) CC, OFS, Tr, SA01 (49007 Sejt., 14 S.D., R.G.A.) contact marks especially to second, nearly very fine and better. DCM LG 27 September 1901. M.I.D. LG 10 September 1901. Frederick Edwin Greene was born in Bow, London. A Musician by occupation, he attested for the Royal Artillery at London on 12 May 1885, aged 19 years, 6 months. Promoted to Corporal in August 1888; to Sergeant in December 1888; to Sergeant-Major in January 1895; reverting to Sergeant in June 1897; and promoted to Company Serjeant-Major in December 1900. Served in Malta, June 1885-February 1888 and May 1898-May 1899; South Africa, February 1900-November 1901; and Bermuda, November 1901-December 1903. Serving in the Boer War he was mentioned in despatches and awarded the DCM. Discharged at his own request 28 October 1904. Ex Glendining’s 7 July 1976. DCM LG 27 September 1901; Army Orders 15, of 1902. Thomas Doughty was born in Boston, Lincolnshire in 1879. As a Private in the 2nd Battalion Lincolnshire Regiment, he was wounded at Gottenburg, 26 August 1900, whilst serving with the 7th Mounted Infantry. He was awarded the DCM for having ‘rendered special and meritorious services, and on being taken prisoner while scouting, effected his escape, being severely wounded in the arm and body’ (ref. The Lincolnshire Chronicle). He was mentioned in Lord Robert’s Despatches of 4 September 1901. He is listed in the Lincolnshire Regiment Old Comrades Association Annual Report for 1911 as a member, living in Spalding and donating 1/-. DCM LG 27 September 1901. Michael Maher was born in the Parish of Callan, Co. Kilkenny. A Labourer by occupation, he attested for the Royal Irish Regiment at Kilkenny on 22 August 1888, aged 19 years. With the regiment he served in India, October 1889-March 1895. Having attained the rank of Sergeant in December 1892, he was reduced to Private in September 1894. As such he was transferred to the Army Reserve in March 1895. Maher rejoined the regiment in May 1898. Soon in trouble, he was convicted by court martial in October for ‘conduct to the prejudice’ and sentenced to 84 days imprisonment with hard labour (28 days were remitted). 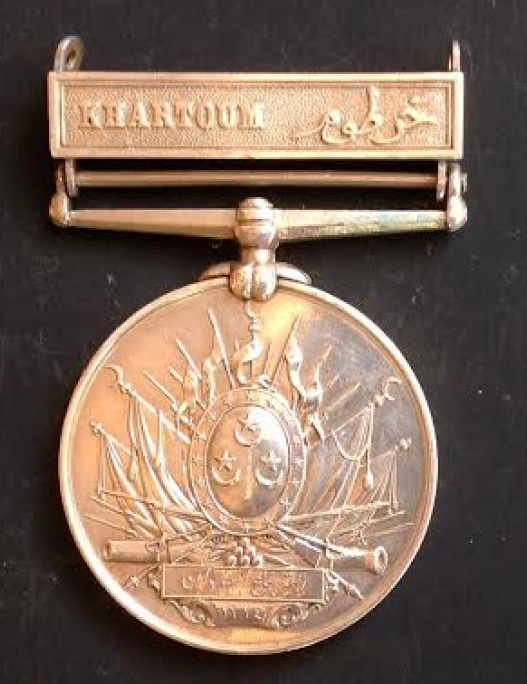 Appointed a Lance-Corporal on 1 December 1899, he was posted to South Africa on the 16th of the month. There, his rank was soon lost, being deprived of his stripe in February 1900. Despite this setback, he served with distinction in South Africa, being awarded the DCM with a gratuity of £20 in addition to the Queen’s medal with (6). Maher served as part of the 5th Battalion Mounted Infantry. Its first action was on 11 February 1900 while reinforcing the flank guard of a convoy in difficulties between Ramah and Roodipan. The regimental history records that in this affair Maher greatly distinguished himself by volunteering to carry a written order to a detachment separated from the main body by a broad stretch of ground completely swept by enemy fire. He set an excellent example by walking, not running, across the danger zone, delivered the note and then refusing to remain under cover with the detachment, cooly returned to report that the order had been delivered. In another affray, he and another private held off an enemy attack by steady, well aimed shooting. He was again mentioned in the regimental history for volunteering to cross a drift in order to ascertain if the further bank of the river was occupied by the enemy. Private Maher returned home in July 1901 and was discharged at the termination of his first period of service. DCM LG 27 September 1901. M.I.D. LG 10 September 1901. William Haynes was born in Pocklington, Yorkshire. A Labourer by occupation and a member of the 1st Volunteer Battalion West Yorkshire Regiment, he attested for the Royal Artillery at York on 28 August 1890, aged 19 years, 11 months. Promoted to Bombardier in May (?) 1894; Sergeant in March 1898; and Battery Sergeant-Major in March 1905. Served in South Africa, January 1900-January 1902. For his services in the Boer War he was mentioned in despatches and awarded the DCM. Awarded the Army LS&GC with gratuity by A.O. 101 of 1909. He claimed his discharged on 31 March 1912. DCM VR (3218 L. Sergt., 5th Imp. Yeo.) replacement suspension, fire damaged and showing considerable pitting, poor	DCM LG 27 September 1901. 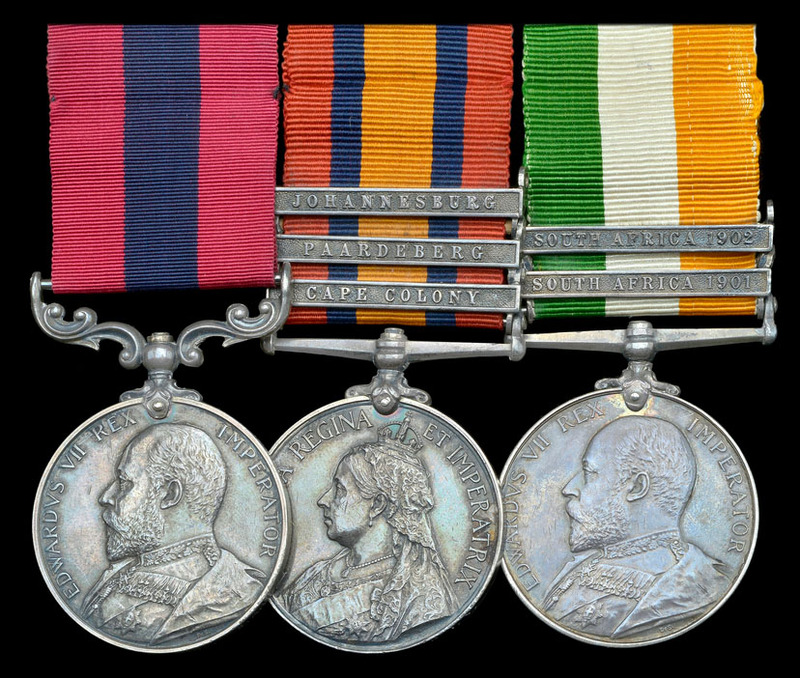 Scott was additionally awarded the Queen’s medal with three state clasps and the clasp for 1901. Served in the 14th (Northumberland) Company 5th Battalion Imperial Yeomanry. DCM LG 31 October 1902. DCM LG 27 September 1901: 2nd Battalion, Gloucestershire Regiment (Mounted Infantry Company). Mentioned in Earl Roberts’ despatch of 29th November 1900 for ‘special and meritorious service in the field.’ Arthur James Clark was born in the Parish of St Michaels, Bristol, and enlisted into the Gloucestershire Regiment at Bristol on 20 April 1891, aged 18 years 9 months, a servant by trade. He was promoted to Corporal in October 1896, appointed Lance-Sergeant in October 1898, and promoted Sergeant in August 1901. He gained his certificate for Mounted Infantry whilst stationed at Cairo, Egypt, on 30 June 1896. 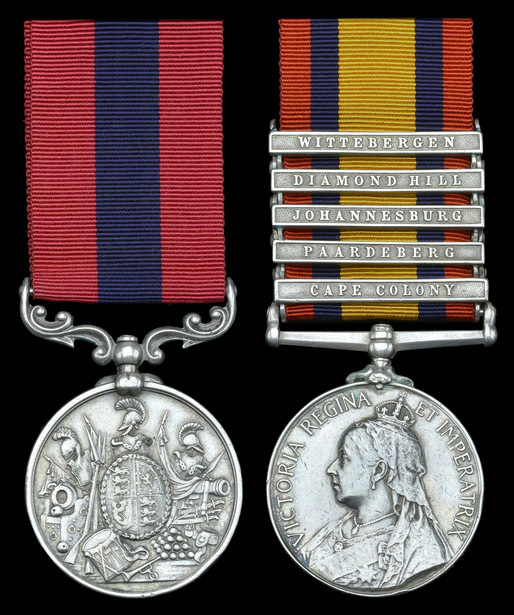 He served in South Africa from 6 January 1900 to 9 August 1902, was mentioned in despatches and awarded the DCM with a gratuity of £20. Sergeant Clark was discharged on 19 April 1903. Group to Sgt Maj T W Vine, CIV & SAC. DCM LG 27 September 1901: Sergeant T W Vine, City of London Imperial Volunteers. Although Vine’s DCM is named to the SAC it was unquestionably won whilst he was serving with the CIV. Thomas Walter Vine was born on 22 July 1870, and joined the Volunteers on 20 July 1887, serving in the 3rd Middlesex Volunteer Artillery. He received the Royal Humane Society’s Honorary Testimonial in October 1891, ‘for having on the 18th April 1891 gone to the rescue of Gunner Sharman, who was in imminent danger of drowning at Shoeburyness, and whose life he gallantly assisted in saving.’ A jeweller and watchmaker by trade, he volunteered to join the City of London Volunteers in January 1900, then aged 29, and served in South Africa with No. 1 Mounted Infantry Company. He was mentioned in despatches (LG 10 September 1901) and awarded the DCM. He was discharged from the CIV Mounted Infantry at Pretoria on 1 October 1900, at his own request to be employed with the South African Constabulary. He served as a Troop Sergeant-Major in the S.A.C. for the remainder of the war and later became a Head Constable. He was discharged from the S.A.C. upon its withdrawal from Swaziland in March 1907, and transferred to the Swaziland Police with whom he served until 1925. Group to Sgt I Barton, Manchester Regiment. Of the 27 DCMs won by members of the Manchester Regiment during the Boer War, just two were in respect of services in the Mounted Infantry. DCM LG 27 September 1901. Isaac Barton was born in Ely, Cambridgeshire, and enlisted in the Manchester Regiment in June 1890, aged 18 years, direct from the 4th (Militia) Battalion. Embarked for India in early 1892, he served there until returning home as a recently promoted Sergeant at the end of 1898, but saw no active service. 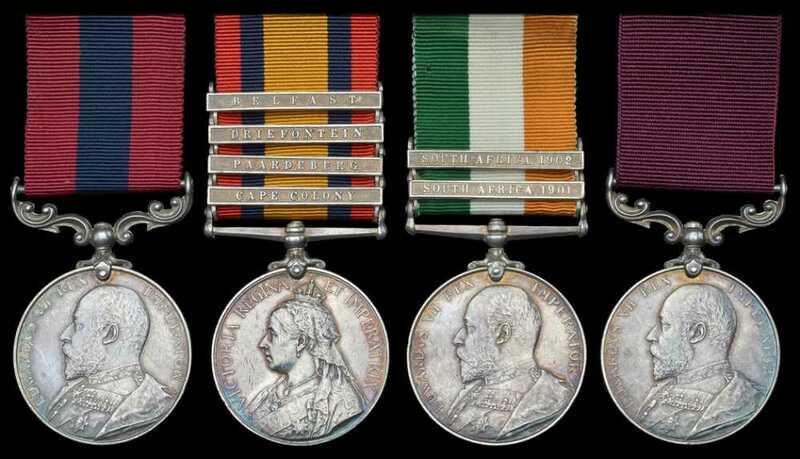 In March 1900, however, he was embarked for South Africa in the 2nd Battalion, where he was actively employed in the Mounted Infantry and awarded the DCM, in addition to gaining entitlement to the clasps for Joh and DH - regimentally rare distinctions verified on his service record. 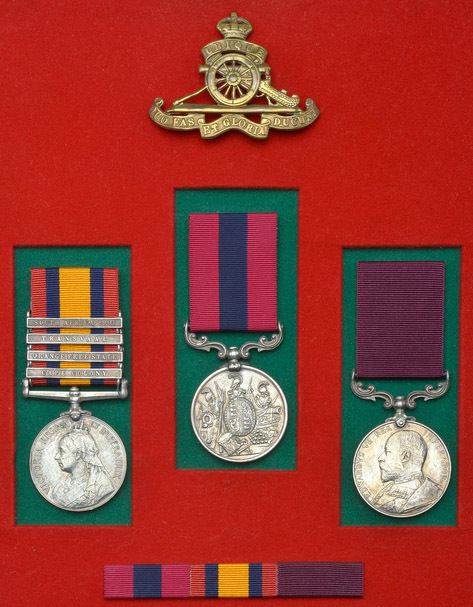 Advanced to Colour-Sergeant in October 1905, Barton added the LS&GC Medal to his accolades in 1908 (AO 554 of 1908 refers), and was finally discharged at Grouville Arsenal, Jersey in June 1911. Norman McLeod was born on the Isle of Harris, Tarbert, Inverness, and, a tailor, enlisted in the Royal Artillery in 1888, aged 21. He went absent without leave twice in 1889 and was imprisoned for 20 days, In 1895 he qualified as a 'Master Tailor to a battery of Artillery'. Posted to 65th Battery and promoted Bombardier in April 1900, he was awarded the DCM . He was discharged in August 1901 and admitted to Chelsea in 1944. Norman McLeod, a Master Tailor, retired, died aged 78 in 1946 in Hornchurch, Essex. On offer at Charlies Medals for £3,500. Arthur Collier was born at Astbury in 1869 and was a labour when he joined up. He joined the 14th Hussars from Nov 1887 till Oct 1889 and then transferred to the 18th Hussars. Until Nov 1889 he was based in the UK. He was then sent to India until Oct 1898. He then sent to South Africa till Oct 1902. 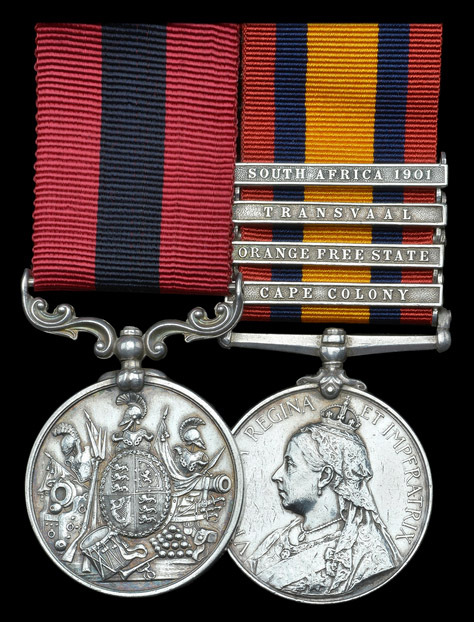 During his time in South Africa he was awarded the KSA & QSA with clasps South Africa 1901 & 1902, Orange Free State, Transvaal, Talana. It was at this battle that he was captured on 20th Oct 1889 and made a prisoner of war but released or escaped on 24th Oct 1889. The action for this was "Turning now to our cavalry, the 18th Hussars received orders at 5.40 am to get round the enemy's right flank and be ready to cut off his retreat. They were accompanied by a portion of the Mounted Infantry and a machine-gun. Making a wide turning movement, they gained the eastern side of Talana Hill. Here Lieutenant Colonel Moller halted with one squadron 18th Hussars, the machine-gun, and Mounted Infantry, sending his two other squadrons farther to the east. These two latter squadrons took part in the pursuit of the enemy, who retreated eastward; but Lieutenant Colonel Moller and the troops with him appear, so far as can be ascertained, to have pursued in a northerly direction, to have come in contact with superior forces not previously engaged, and to have been surrounded and forced to surrender while endeavouring to return to camp round the north of Impati Mountain". 'The Times' historian states that Colonel Moller arrived at a strong defensible position from which he could have stampeded the whole of the Boers' ponies and commanded their line of retreat; that Major Knox begged to be allowed to fire on the ponies, but instead was ordered to advance with two squadrons right in rear of the Boer position. This and the rest of Colonel Moller's proceedings are inexplicable. After exhibiting great rashness he seems to have become unnerved. Knox with difficulty got back with his two squadrons. The others were taken prisoners. In his evidence before the court of inquiry Colonel Moller gave his reasons for taking the road he did, but Captain Lonsdale of the 2nd Dublin Fusiliers Mounted Infantry stated that he had informed the colonel he was taking the wrong road. The officers and men were exonerated, but Lord Roberts did not allow Colonel Moller to rejoin his regiment. 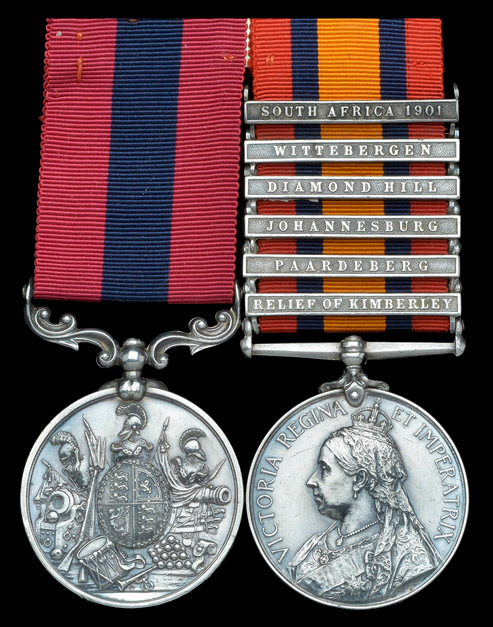 In the London Gazette 19th April 1901 he was awarded the DCM for gallant conduct in South Africa. He arrived home Nov 1902 and was awarded a LS&GC medal in 1907 by now a Staff Sgt Major. In 1908 he was made Sgt Instructor. When WW1 started he was attached to the 1st/1st Queen's Own Oxford Hussars and was sent to France on 20th Sept 1914 and became the first territorial unit to land and see action. He was awarded a Bar to his DCM in the London Gazette 14th Jan 1916 "For conspicuous gallantry and devotion - he brought in six wounded men from the front trenches under a heavy fire, the men having been left out from the previous day's engagement. He has invariably shown great bravery and coolness under fire, and set a fine example to all ranks". Subsequently this bar to his DCM is cancelled in the London Gazette 17th April 1917 and replaced by the Military Cross. The Regimental History shows that in October 1914 when the regt was at St Omer A.Collier was SSM (Squadron Sergt Major) of 'C' Squadron (Henley -on-Thames). In February 1916 he was appointed RSM when the previous RSM (Pearce) went back to England due to ill-health. On 20th November 1916 "Mr Collier, the RSM, had to go to hospital in England. He had almost completely lost his voice, and although he seemed quite confident that he would get right and come out again, he died of consumption in June 1917." He is buried in Henley-on-Thames cemetery. "During the first 18 months of the war he [Collier] had been a pillar of strength to 'C' squadron, and a constant help and support, first to Major Nicholl, and then to Major Val Fleming [brother to Ian Fleming - James Bond] his squadron leaders, who always thought very highly of him. His promotion to be RSM in February 1916, at the same time as Major Fleming became Second-in-Command of the Regiment, was a serious loss to his old squadron, but he never forgot his old friends there and always took a special interest in their welfare and efficiency. The perpetual office work at Headquarters was not much to his taste; his greatest wish was for real cavalry fighting and a chance to use his sword, failing which, he was happiest in the front trenches. If perhaps he seemed rather stern and grim to those who did not know him well, especially to young officers and men, he was always popular with the sergeants and respected by the senior officers. He was a fine soldier and a brave man."